The best way to explore the historical city Kortrijk. The hotel is located next to the train station, in the heart of the city. The exposition center is only a 2 min drive. Hungry or thirsty? Visit our Rendez-Vous bar, which is open 24 hours a day. Located in the centre of Courtrai, the ibis Kortrijk Centrum hotel is close to sights such as Saint-Martin church and the Belfry. The Grand Place is bustling with bars and restaurants. Visit the Beguinage convent or go back in time at the Courtrai museum. Or admire the Broel Towers, the old city fortifications. Other attractions which are well worth a visit are the Koning Albert Park, 1302 Museum, the Buda island, situated on the river de Leie and 't Hooghe Castle with the famous rose garden. 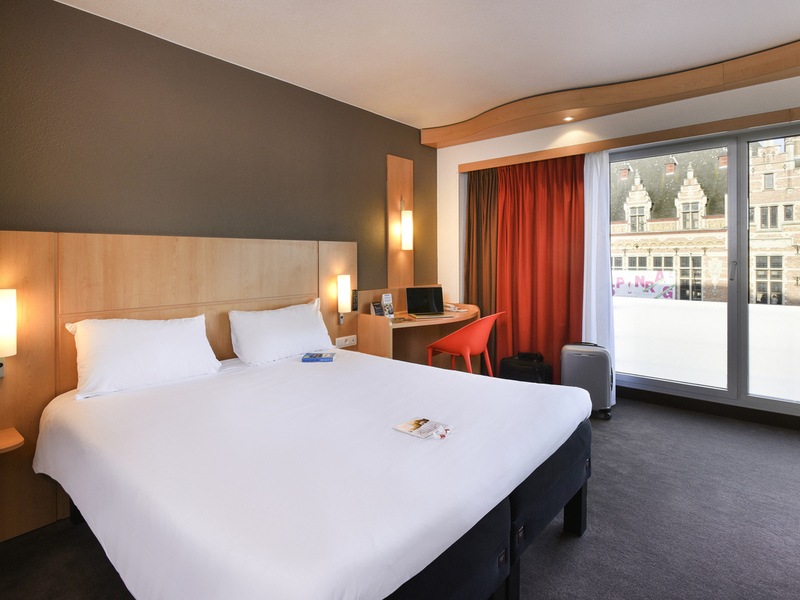 Our hotel is conveniently located nearby Courtrai's central train station. Furthermore, by car you can reach the A14/E17 highway within minutes, which takes you either to Antwerp (north) or to France (south). Premium extra space room with city center view, extra amenities and a queen size bed. Stayed here before and decided to book here again with our Daughter, her Partner and our grandson., They had an lovely large family room and were very happy with the cleanliness.. Recommend this Hotel for couples and families . .Very close to parking.. Amenities and facilities as expected. Breakfast nice. Bathroom has mould in shower, shower door did not close properly and shower head leaked. Just a overnight stop, have stayed here before. Very comfortable and clean, Good check in staff. My Daughter, her partner and son had an lovely family room.. how room was just as good. Okay. Room was clean and tidy and met expectations. Hotel in general appeared well kept. Breakfast was very dissapointing every day (3 days). There was always missing items from hot food and cold juice and often no one around to ask. Air con in room had no affect on temperature. Had to leave window open most nights which was concerning as it was on a level where people could enter through the window. Rooms comfortable, reception staff and breakfast staff are very professional. When I called to book originally on Sunday I couldn't as you where to busy! Card would not work after three attempt a walking up and down to reception. Had to change the batteries in the door . The the room was adjoined to another and was a shared door to a bathroom which was loud . I could hear them in the toilet very creepy . I was tempted to record it and put it on TripAdvisor. The hotel is in a great location in Kortrijk close to many local facilities. - I was asked to pay the complete 5 nights on my arrival day --> Wrong - Since I refused, a warranty was taken on my credit card for the complete amount --> Wrong - When I asked to put a dinner on my invoice, it was not possible because de warranty, so I had to pay it on a separate invoice --> Wrong - When I went to pay the bill the night before leaving, they could not issue the invoice --> Wrong - I had to queue in the morning to get my invoice, and then they told me they forgot the last night on the day before payment --> Wrong - In the morning, I got an email asking me if I was happy with the fast check out... Are you kidding???? ?